Since I’ve had cake pops (and cake balls and cupcake bites) on the brain lately, I decided that’s what I would veganize. It needed to be done, don’t you think? Who says we need butter and eggs to make a delicious cake pop? This recipe proves you don’t! And you don’t even need any strange or fake ingredients to get your dairy and egg-free cake pops groove on. This recipe consists of common, every day ingredients, or those that you can easily find at any supermarket without looking in any special sections. They are delicious! In a side-by-side comparison I have to admit I do slightly prefer the taste of regular cake pops, but I donated most of this vegan batch to be served at a sister’s housewarming to non-vegan guests and they were none the wiser, all enjoying them thoroughly. These have more of a homemade taste and aren’t as sweet, but there was nary a complaint and I even overheard the children begging for seconds. I ate six of them myself, so that should give you an idea of how much I liked them since I pretty much blew my entire weekly Weight Watchers Points Plus allowance on them. One reader recently left a comment on my cake pops post asking if they were any good because I failed to mention that in my post. What? Me, forget to rhapsodize about how great cake pops are? How did that happen? I couldn’t believe it! Well, let me ameliorate that omission right here and now. They. are. so. good. The center is more dense than cake and the frosting, being mixed in, gives it a little bit of a truffle-like consistency (but still with the taste of cake), and the chocolate shell gives it more of a candy feel. A cake pop is like the perfect blend of cake and candy. And that is just what these are. Cake-candy perfection. Need I say more? Let’s do this! Pull off chunks of cooled cake and process them in a food processor in batches until fine crumbs, putting the crumbs in a large bowl. Add 1 cup of the icing and mix up with your hands until the icing is completely incorporated. You will most likely need more, but it is better to start with less than to add too much right off the bat. I added more after taking this photo, using about a cup total, and I should have used a little more–the dough was a little stiff and should have been less thick. Roll into balls the size of walnuts (a small cookie scoop works well for portioning–mine fits a tablespoon of dough) and place on a cookie sheet. Cover with plastic wrap and refrigerate two hours or overnight. Gently melt chocolate with the oil in a double boiler or in the microwave. If using the microwave, stir every fifteen seconds after an initial 30 seconds. Once chocolate is mostly melted, remove from heat and stir, stir, stir, until the residual heat melts the rest of it. Don’t overheat your chocolate or it will become too thick to dip your pops. Check out the ingredients-Ghirardelli semisweet chocolate chips are naturally vegan and have a delicious chocolate flavor with underlying floral notes. 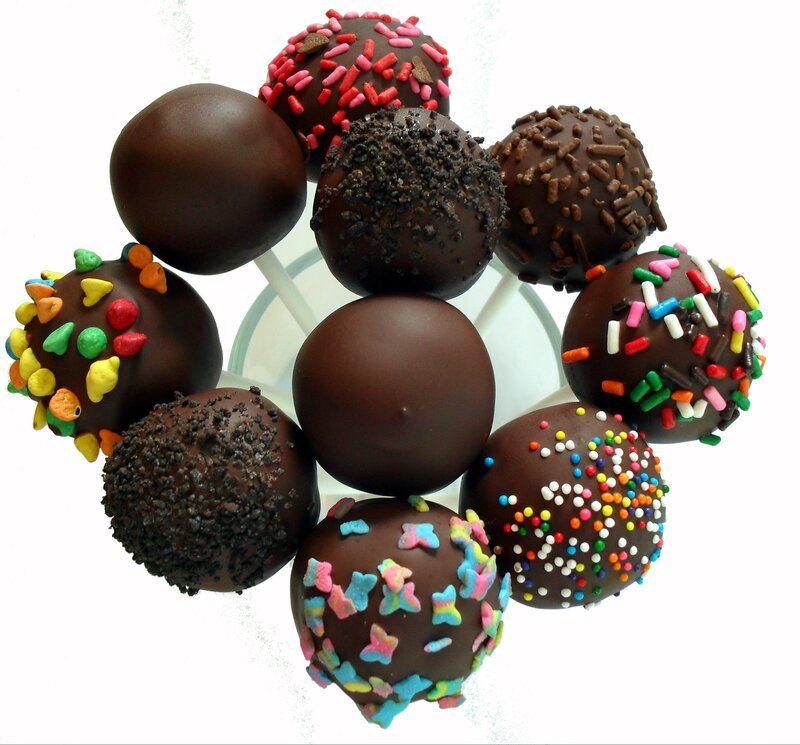 Remove cake balls from refrigerator and dip one end of the lollipop sticks into the chocolate, then insert half way into each ball. Once there are sticks in all the balls, place the tray in the fridge and take them out one by one to dip so they stay cold during the dipping process. Take each by the stick and dip into the chocolate, tapping off excess, apply sprinkles if you wish, then insert into foam block to set up. Repeat until all pops are dipped. I was multitasking on Saturday. Behind the cake pops are two round cakes, wrapped until I had the time to frost them, two sticks of butter waiting to be turned into frosting, and cake tops in a small bowl, waiting to be turned into more cake pops once the icing was made. I never waste cake! Most sprinkles are naturally vegan. I checked the labels on my entire sprinkles collection and found no animal products listed in the ingredients, inlcluding in the mini candy-coated chocolate drops in the Chocolate Accents jar. Place your foam block in the refrigerator or freezer to set the chocolate. Once it’s hardened, you can arrange them on a platter or package them individually by slipping a small plastic treat bag over the top and tie it with a ribbon. The chocolate coating on these melts at a lower temperature than regular candy coating, so store in the refrigerator until ready to serve. Posted in Cake & Frosting, Candy, Vegetarian & Vegan and tagged chocolate, chocolate covered katie, recipe, vegan cake pops. Bookmark the permalink. These sound and look terrific. But I must admit that it was your comment about the “underlying floral notes” of the Ghirardelli semi-sweet chocolate chips that really got my attention. Now I MUST go buy some of them so I can experience those “notes.” Maybe I’ll savor them while sitting outside in the fresh air to enhance the experience. Do you think I should dress up for this? That made me giggle! Yes, and you need a tiara too! hehe! Let me know if you can detect the floral notes, maybe I’m crazy! 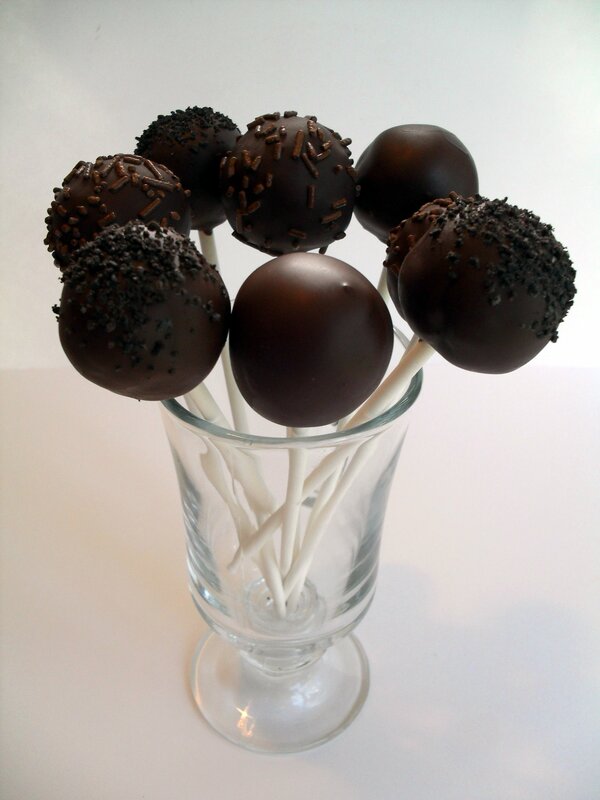 Your vegan cake pops look amazing, you make them so beautifully! Thanks, Lauren. They are easy to make, just a long process. Oh my gosh wow! I am in love with this post! Only one problem… how on earth can I choose a photo to feature? They ALL look so amazing! DUDE I LOVE that shirt. Real girls eat cake FO SHO. And what adorable cake pops! I have always had serious successes with vegan baked goods, so I know I’d be a fan of these! Thanks! I had it made at http://www.customizedgirl.com. It’s definitely a favorite! I so want to make these! I’ve been meaning to do this forever! So cute! My kids would have so much fun with these. I have totally bookmarked this post. I will be making these ASAP! I have twin toddlers who are allergic to eggs and dairy. Can’t wait to try this recipe! thanks a ton. Oh wow, these are so beautiful! I have always thought that cake pops are so hard to make- but this actually looks do-able! How cool it would be to serve these at a party! If you like to make vegan cakes every now and again you should try the “Vegan Cupcakes Take Over the World” book. It’s pretty much all of what I use when I do my cakes and cupcakes and everyone I know loves each and every flavour. My favorites are the Chai Latte cake and the Low-Fat Vanilla cake. The vanilla one has applesauce in it so the cake is super moist and mildy fruity! These look delicious. :) I totally want to try this. What a great post!! I’ve been wanting to do this but knew that I was going to need a vegan option (I also have a recipe for the cake and it’s my go to for chocolate cake every time!). However, if you are making them for someone who wants pretty colors, how do you do that? I checked out the Ghiardelli WC chips and they have milk powder and milk fat in them. I found a recipe for making my own white chocolate, but the ingredients are quite expensive. Can you help?? I ran into the same problem when trying to find vegan white chocolate or colored candy melts. It’s not easily available, though I did find these online: http://store.veganessentials.com/dairy-free-white-chocolate-chips-p1168.aspx, which you could color with powdered food coloring or candy coloring. I’ve made my own vegan white chocolate, and it is super expensive, and it also is less opaque than regular white chocolate so it wouldn’t cover the cake balls as well (you could see through it). I would either not give an option of colored vegan pops, or buy those ones online. I’m not vegan, but I do enjoy making vegan goodies for my vegan friends. I was curious about how vegans felt about the chocolate being made on the same equipment that makes products with milk. I was a bit confused when I found “vegan” carob chips that said that the product contained traces of milk because of the equipment.So I’m guessing this doesn’t really bother anyone, so long as they aren’t actually made with milk? I’m in the same boat as you–I’m not vegan but enjoy making vegan foods for my friends with allergies. So I’m not sure how they feel about that. It probably depends on the person. I was going to say that just because those chocolate chips don’t say milk doesn’t make them vegan. The word chocolate usually means milk chocolate. I don’t say this as a vegan but as someone with a dairy allergy. One needs to stick to dark chocolate (even that sometimes isn’t 100% dairy free) or carob chips to be sure there is no dairy. I have tot tell you that recipe is great. And thanks for sharing. I made it for my boy’s Class party and the kids really like it alot. That is great to hear! Thank you for letting me know! I love your post!! I enjoy making CakePops and was recently asked by a vegan to make some. Love the T-Shirt too!! Did you check to see if the artificial colors in the sprinkles you used came from animal sources? Even if they didn’t, all artificial colors are tested on animals. Nowhere near vegan friendly. Re: sprinkles. Most of what is pictured is not vegan friendly. The mini chocolate chips may contain dairy. Most wilton or other big brand sprinkles have dairy, bug or animal-based colors or flavors or a form of beeswax coating (not cool with some vegans) or gelatin in them. I like “Sprinkels” brand 100% vegan sprinkles and jimmies but they are pricey and hard to find (in California I buy them at Mother’s Market or Whole Foods) or they are online. Or use crushed Oreos (yes they are really vegan!) or raw sugar crystals? 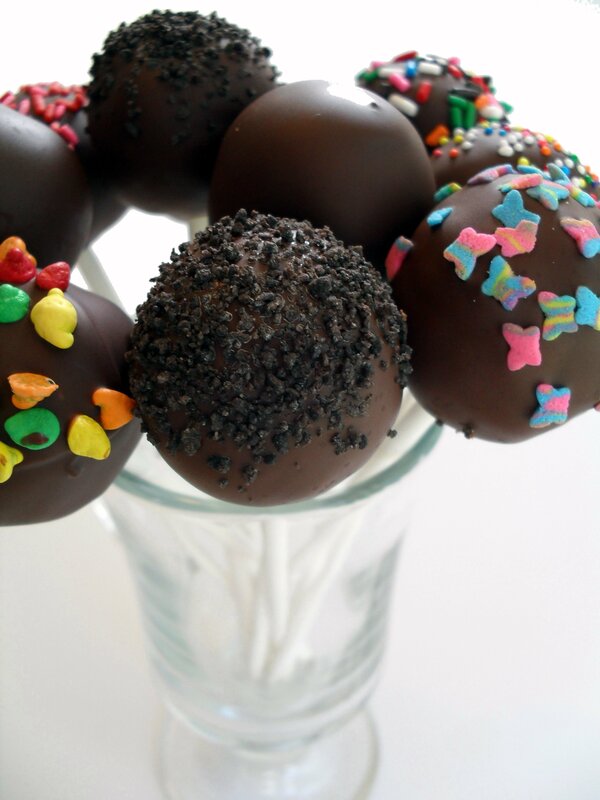 I just made these cake balls and they turned out fabulous. This is the only vegan cake recipe I have ever found that didn’t turn out terribly (I’m not even kidding) I just wanted to say that you are my baking hero! This recipe is just amazing! Thanks so much for sharing! Yay yay yay! I’m so thrilled to hear this-thank you for letting me know how much you liked this! these turned out great!! i actually like them better then the regular…a little less sweet, a little more chocolatey!! you don’t happen to have the nutritional info do you? Thanks for the feedback, I’m so glad you like them! Sorry, I don’t have the nutritional info but I know websites like sparkrecipes.com have recipe builders you can use to calculate nutritional info. Well, my comment is a long time coming as I have now used your cake pop tutorial and (modified-to-be-gluten-free-too) vegan cake recipe 2 years running for 2 of my kids birthday ‘cakes’. They were such a hit last year for the 3 year old party, that the turned 7 today big sister wanted them instead of cupcakes to share with her class at school. And the anaphylactic to egg child in her class was SO thankful. And the remaining pops will be going to my friends nut free book launch covered innut free chocolate :) I may even be trying them again with your white wacky cake for my turning 9 child who seems to have trouble with chocolate. Claire, that is so great to hear! Honestly I’m so spoiled to regular cake pops that these were a bit disappointing to me and I wondered if I even should have posted the recipe. But hearing your feedback confirms I was right to do it! Thank you! Hi- I was wondering if you have ever made them with out a food processor and just crushed them by hand? I have the cake cooling as we speak. How long do you think they can last in the refrigerator before serving them? I have to make 100 for Saturday. Today is my test batch. Any tips on how to transport them an hour and a half a way by train. Will the chocolate topping melt? I think so, and if I remember correctly, it is harder to get the icing incorporated as well, but it’s possible. They last about a week in the fridge. I would definitely package them individually like in my regular cake pops post (https://veronicascornucopia.com/2010/01/20/cake-pops-2/) to keep them from getting dinged up during transport, and keep them in a cooler with a cold pack since the chocolate is fairly soft and needs to stay cold to prevent getting damaged or melting. These look amazing! I’d like to try making these for Christmas when my nephew, who is allergic to dairy and egg, is coming to stay. I don’t want to leave myself too much to do… Have you ever tried freezing these? I guess pre-dipping? I’m hoping I can make them now and then dip and decorate a couple of days ahead. I made these for my friend’s bridal shower and it was aweeeesssooomme!!! It looked so beautiful and was so very yummy!!! If I already have enjoy life chocolate chips on hand, will those work?